Graduation highlight photos by Lauren Bliss. Seniors Jessie Reynolds, Mackenzie Miller, and Samantha and Cassidy Ingram opened the ceremony with a quartet arrangement of the “Star Spangled Banner.” It’s no surprise that the performance was flawless, considering the group was comprised of an All-State Chorus member, two future actresses, and the star of the LSTS musicals. The singing groups also performed “Lampeter Strasburg’s Alma Matter” and “If You’re Out There” by John Legend. Sam Ingram reassuring the graduates that "It's okay." High School Principal Mr. Eric Spencer, during his last ever L-S graduation introduction, reminded the graduates of their achievements, one being the cumulative 14,428 community service hours that they had completed. He alluded to the stellar academic achievements of the high school, and the individuals who accomplished such feats. Midway through his speech, he checked his Twitter to remind the audience members already in attendance that the ceremony was to be held inside. He used this comical reference to recognize the achievements of LS News and the legacy LS News editor-in-chief Ben Pontz and Mr. Adam Zurn had started. He closed by quoting various people on friendship, and reminding the graduates to cherish the times and friendships from High School, for they make lifelong memories. 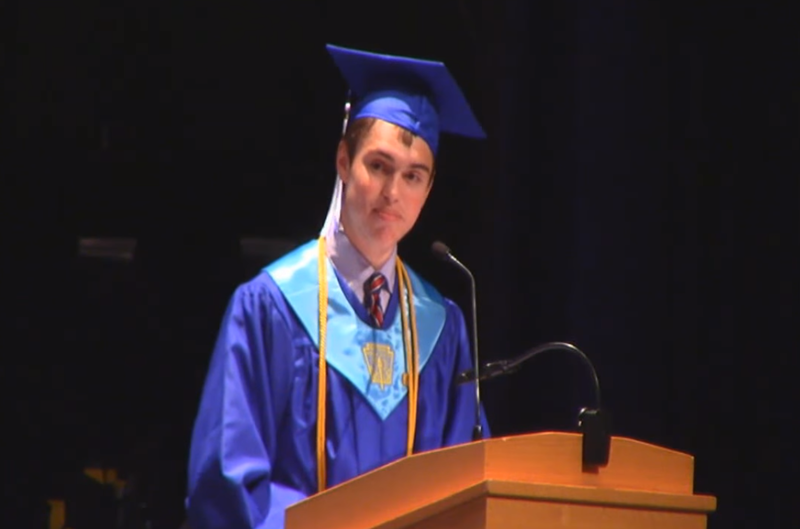 Valedictorian Ben Pontz speaking how fortunate Lampeter-Strasburg students are to receive a quality education. One by one, he had the parents and teachers stand so the graduates could recognize the role they played in the education they had received. He continued on by asking Andrew Hay to stand and clap, to create a chain reaction of clapping. An unexpected, slightly odd request, the act actually served as a way to remind the audience the impact that one person can have on a majority. Spencer returned to the podium to announce the Valedictorian as Ben Pontz, the Co-Salutatorians Beth DiBiase and Caleb Gawne, and the Third in Class as Robin Feaster. 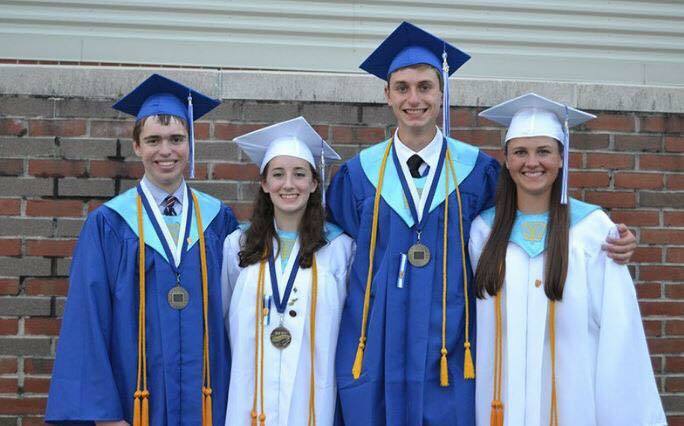 Left to right: Valedictorian as Ben Pontz, the Co-Salutatorians Beth DiBiase and Caleb Gawne, and the Third in Class as Robin Feaster. Superintendent Dr. Kevin Peart added his own flair by reading aloud the lyrics of the Class of 2016’s class song, “We’re All in This Together” from High School Musical. Not many of the graduates have heard the lyrics spoken by anyone other than Zac Efron, so there were quite a few chuckles among the students. The Class of 2016 celebrating the end of their 4,665 day journey according to Valedictorian Ben Pontz. 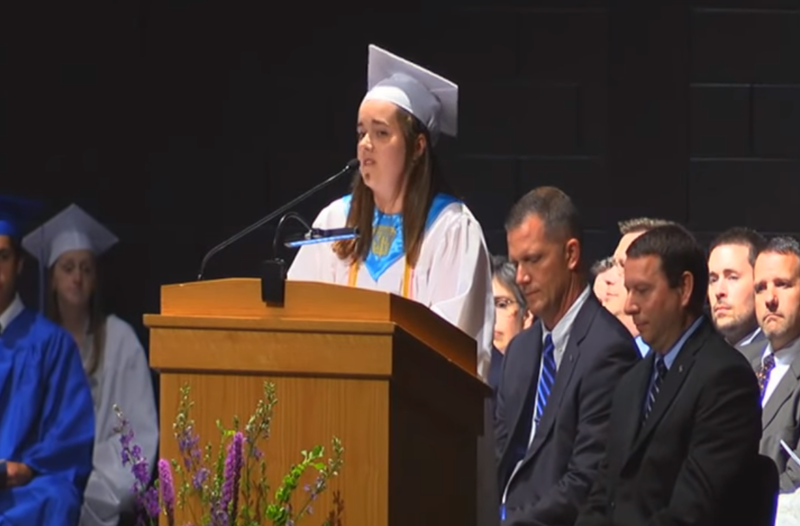 The first two to receive their diplomas were student council officers Riley Lewis and Erin Murphy, and they continued on to read the name of every graduate as they received their diplomas. Class President and 2015 West Lampeter Fair Queen Chelsea Hancock concluded the ceremony by telling the students to turn their tassels. 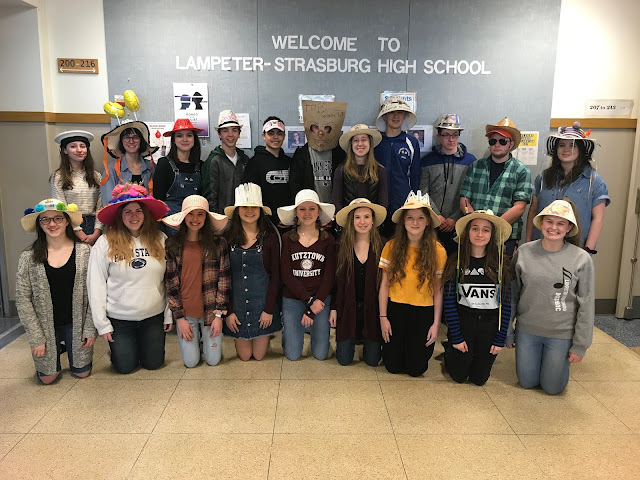 As the graduates threw their caps up in the air, their journey as Lampeter-Strasburg High School Alumni began. Watch the entire Friday, June 3 Lampeter-Strasburg graduation ceremony. See all of Lauren Bliss' gradation photos.